Provided photo ”Breaking the Ice,” a pencil drawing by Thomas Kinarney of Dayton, won Best of Show at the Annual Piqua Fine Art Exhibit awards reception on Sept. 6. The Annual Piqua Fine Art Exhibit is open to the public Monday through Friday from 10:30 a.m. to 5 p.m. and Saturdays from 10:30 a.m. to 4 p.m. at Apple Tree Gallery on their second floor until Sept. 28. To purchase artwork from the exhibit, contact Piqua Arts Council at (937) 773-9630. PIQUA — Piqua Arts Council opened its 26th Annual Piqua Fine Art Exhibition on Sept. 6 at the Apple Tree Gallery with an awards reception. Announced first were the Business and Community Leader Awards picked by representatives from various businesses in Piqua. The Adam and Eve Award went to Robine Wright for her painting Horse Sense, Unity National Bank Award went to Phillip Erbaugh for Descending Flat Top, The Polysouce Award went to Leonard Williams for Thank You Mother Nature, The Koverman Staley Dickerson Award went to Joyce Fisher for Burning Bright, The Mainstreet Piqua Award went to Tracy Oñoz for her painting Marbles, Marbles, The McCoullogh, Felger, Fite and Gutmann Award went to Linda Lock for Color Explosion, The Mullenbrock and Associates Award went to Tracy Oñoz for Trinidad, the Jim and Cheryl Burkhardt Award went to Mike Underwood for Night Fall in Provence, the Eagle Printing and Graphics Award went to Barbara Carruthers for Breathing Space and the Upper Valley Career Center Award went to Mojgan Samardar for Meditation in Blue. Next up, the Piqua Public Library Purchase Awards. The Library purchases the work and adds it to their permanent collection, placing the works on display in the library. Their first purchase was a pastel drawing Fire in the Mind by Jim Moore, their second purchase was a watercolor Nancy’s Flowers by Kathy Moeller and their final purchase of the year was a watercolor Before the Fire by Marsha Elliott. Following the business and community leaders, Jordan Knepper, executive director of the Piqua Arts Council continued with the picks from juror David Mueller. The Thelma Anderson Award for the Best Piqua Artist went to Dennis Walker for his blown glass piece Glass Piece, the Kathy Oda Memorial Award for Best Black and White Photo went to Theresa Anderson for her photograph Pontiac Indian. In the Miscellaneous category, third place went to Jeanne Wenrick for her piece Who’s Not Afraid, second place to Jan Lendino for her work An Afternoon with Friends, and first place to Kathy A. Moore for Coffee Mug Still Life with Self Portrait. The Three-Dimensional category saw third place go to Mark Johnson for his carving Baby Sea Turtle, second place to Jodi Knoch for her wool felt work Powered By U, and first place to Steve Burelison for his carving Shaky Approach. In the Photography category the second honorable mention went to Gina Duncan for R.I.P. Iconic Stadium Tree, first honorable mention went to Merrill Asher for Eat My Way Out, third place went to Jeff Doseck for The Dark Room, second place went to Merrill Asher for High a Roller and first place went toBruce Soifer for Storm Over Piqua Plaza. In Water Media, second honorable mention went to Dance Away by Shirlee Baurer, first honorable mention went to Kenneburkport Beach by Cody Heichel, third place went to Lori Meyer for her work To Be Determined, second place to Cody Heichel for Morning in Kennebunkport, and first place went to Kathy Moeller for Looking North. For the Drawing category, the second honorable mention went toKay Cress for Confederate Soldier, first honorable mention to Thomas Kinarney for Red Grapes, third place for Savannah’s Beauty by Selena Burk, second place to Linda Lock for her Serenity, and first place toJordan Fisher for Untitled #2. The most awards went to the Oil and Acrylic category. The sixth honorable mention went to Thomas Emerine for Pride of Uganda, fifth honorable mention went to Jerry Whited for View from Winans, fourth honorable mention went to Barbara Carruthers for Summer Shade, third honorable mention went to Michelle Geissbuhler for Chateau de Rocheccotte Chapel, second honorable mention to Linda Lock for Color Explosion, and first honorable mention to Dan Knepper for Amy’s Sky. Cash prizes went to Phillip Erbaugh for his third place painting Old Rocker, second place to Jane Flewellen for her painting Matt and first place to Dan Knepper for Dance, Mr. Matisse. Before the final award of the night was announced, Knepper threw a small twist into the evening. Because there weren’t enough pieces in the exhibit for the Ceramics award, Knepper invited guests to the exhibit to select a Reception Choice Winner. Once the votes were tallied, Margaret Green won the award for her photograph Vik. The final award for the evening was the Best of Show. 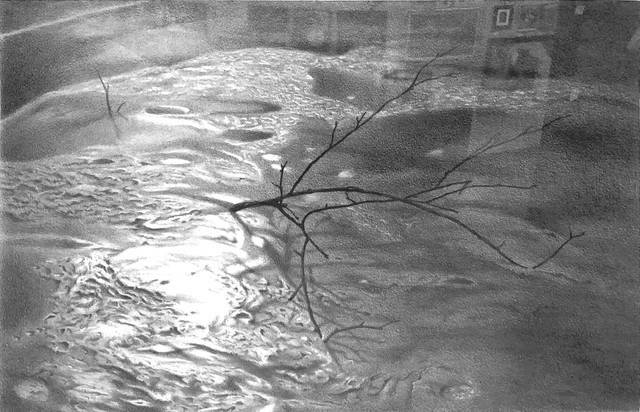 For the 26th Annual Piqua Fine Art Exhibition, Thomas Kinarney from Dayton won with his pencil drawing Breaking the Ice. https://www.dailycall.com/wp-content/uploads/sites/30/2018/09/web1_Tom-Kinarney-Breaking-the-Ice.jpgProvided photo ”Breaking the Ice,” a pencil drawing by Thomas Kinarney of Dayton, won Best of Show at the Annual Piqua Fine Art Exhibit awards reception on Sept. 6.